Abstract: Hardware/software (HW/SW) co-design has emerged as a crucial and integral part in the development of various embedded applications. Moreover, the increases in the number of embedded multimedia and medical applications make streaming throughput an important attribute of Multi-Processor System-on-Chip (MPSoC). As an important development step, HW/SW partitioning affects the system performance. This paper formulates the optimization of HW/SW partitioning aiming at maximizing streaming throughput with predefined area constraint, targeted for multi-processor system with hardware accelerator sharing capability. Software-oriented and hardware-oriented greedy heuristics for HW/SW partitioning are proposed, as well as a branch-and-bound algorithm with best-first search that utilizes greedy results as initial best solution. Several random graphs and two multimedia applications (JPEG encoder and MP3 decoder) are used for performance benchmarking against brute force ground truth. Results show that the proposed greedy algorithms produce fast solutions which achieve 87.7% and 84.2% near-optimal solution respectively compared to ground truth result. With the aid of greedy result as initial solution, the proposed branch-and-bound algorithm is able to produce ground truth solution up to 2.4741e+8 times faster in HW/SW partitioning time compared to exhaustive brute force method. Abstract: A crane system is very important in industries as the system is used to transport a heavy load from one place to another. A double-pendulum type overhead crane system is very difficult to control as it suffers from payload sway and double-pendulum dynamics. These affect the system performance and the safety of the operation. 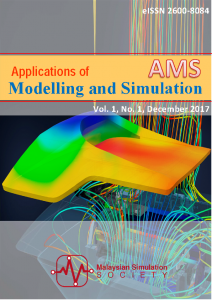 This paper focuses on the mathematical modelling and sway control of a double-pendulum overhead crane system. The mathematical model of a double-pendulum overhead crane system is obtained through the Euler-Lagrange methods. The dynamic model is then verified through simulations and experiments. The simulation is carried out using the Simulink block diagram in MATLAB whereas the experiment is carried out using a laboratory overhead crane. Upon obtaining an accurate dynamic model of the double-pendulum overhead crane system, controllers based on input shaping are designed to improve the system performance. Abstract: This paper discusses the external consensus problem for non-identical networked multi-agent systems (NMAS) with network data loss, considering uniform consecutive data losses (CDL) induced by long periods of transmission failure. A gain error ratio (GER) formula is proposed to determine the appropriate value of coupling gain between agents in order to minimize the computed prediction error caused by the prediction process. Consequently, the consensus performance with prediction control strategy can be improved. The effectiveness of the proposed formula is demonstrated through simulation. Abstract: This paper presents modelling and control of DWR 1.0, a two wheeled mobile robot. This balancing robot is one of the applications of an inverted pendulum on a two wheel. A relatively recent offshoot of the classical inverted pendulum is the wheel inverted pendulum, popularized in contemporary culture by the Segway Personal Transporter. However, the mathematical model for a wheel inverted pendulum do not account for the full complexity of the construction of the platform. The mathematical model obtained in this work with the measured parameters is simulated using Matlab and PID control parameters are determined. Finally, PID control algorithm is implemented on the two-wheeled mobile robot to test the accuracy of the model. Abstract: In Network-on-Chip (NoC), most thermal and peak power balancing methods are monitored by centralized power/thermal managers. This increases inter-core communication latency and imbalanced thermal distribution. These factors directly affect the hot spot formation caused by high power densities developed with increasing per-core transistor number. As a result, reliability decreases along with static power dissipation. This proposal aims to introduce hierarchical agents for balancing power and thermal distribution by manipulating system’s parameters such as power, thermal, voltage below the optimal values. As some level of control is applied, this proposal also targets to achieve network scalability by implementing some level of independencies; self-organize and self-optimize distributed agent in overcoming core-level homogeneous processing element (PE) thermal and power variations at runtime. The aims of this work are to significantly contribute to achieving runtime thermal and power balancing, power and thermal management and reducing thermal hot spot formation in NoC.